Commissioned by H.H. Sheikh Mohammed Bin Khalifa Al Thani in 2013 as part of Lusail City’s masterplan to create a sustainable, integrated community, Zaha Hadid designed two projects for Al Alfia Holding. Zaha Hadid Architects (ZHA) will now develop the first project, a 70,000 sqm hotel with residential apartments to complete in 2020, in Lusail City’s Marina District. 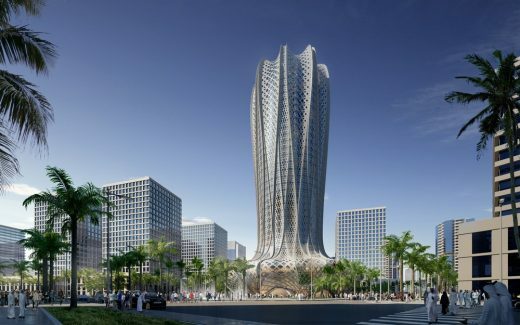 The second of Hadid’s designs commissioned by Al Alfia Holding will be built within the on-going plan for future development of the city. Designed with innovative solutions as an environmentally sustainable community of 450,000 residents and visitors, Lusail City incorporates a 38km light rail system to transport them throughout the city with direct connection to the wider Doha Metro network. Integrating its management and conservation of water within an urban landscape, the city’s energy, communications and transportation systems are also planned to automatically adapt to continually changing weather and traffic conditions, making Lusail the most sustainable city in the region. Continuing these ecological considerations, the formal composition of Hadid’s design has been inspired by the structure of the Desert Hyacinth; a flowering plant native to the landscapes and coastlines of the Arabian Gulf. The nine-pointed form of the building’s podium surrounds a central core defined by the interwoven fluid geometries of the hyacinth. A filigreed mashrabiya façade envelops the building to reduce solar gain. Fluidity is embedded within the region’s architectural heritage and traditions. Continuous calligraphic and geometric patterns flow from domes to ceilings, ceilings to walls, walls to floors, establishing seamless relationships and blurring distinctions between architectural elements. 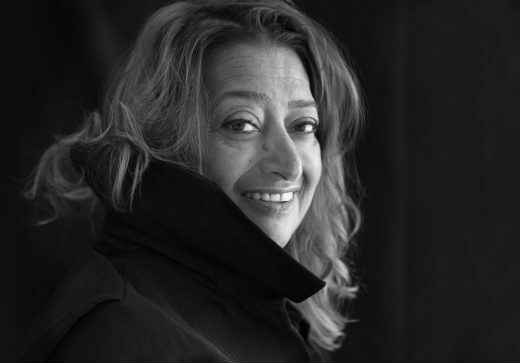 Zaha Hadid developed this historical understanding of the region’s architecture in a contemporary interpretation evolving from her research into natural systems of organization and structure, as well as applying the possibilities achieved through advancements in design, construction and material technologies to deliver workable solutions for the 21st century. “We often look at nature’s systems when we work to create environments; at her unrivalled logic and coherence,” Zaha Hadid previously explained. Hadid’s work sees form and space composed into fluid spatial progressions. Transforming notions of what can be achieved in concrete, steel and glass, Zaha Hadid’s architecture combines her unwavering optimism for the future and belief in the power of invention with concepts of connectivity and fluidity. Working with Arup Engineering and Atelier Ten, global leaders in environmental design and engineering, Zaha Hadid Architects’ vision for the 38-storey project embraces collaboration between disciplines, responding to current and future environmental challenges and providing the most comfortable living spaces for residents, guests, visitors and staff. “With truly inspirational public spaces and atrium, 120 unique residences and 200 hotel rooms of Zaha Hadid’s unmistakable signature, we celebrate her remarkable legacy and continue Lusail City’s commitment to creating the region’s most sustainable, interconnected community,” said H.H. Sheikh Mohammed Bin Khalifa Al Thani, Chairman of Al Alfia Holding.